Why do you put celery in a bloody mary? 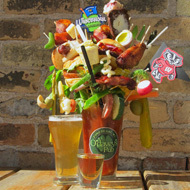 Why do you put celery in a bloody mary? Is there a chemical reason for this or is it done just for garnish? It's meant to be munched on between sips, and permits a "reset" - the cocktail will be fresh upon the tongue the sip after the bite, permitting you to enjoy its flavor and consistency without being oppressed by the cumulative effect of unctuous, spice and salt that is the hallmark of the beverage. Celery is an astringent and an aromatic - it will cut through the palate-coating tomato juice can leave behind, cool the intensity of the salt and heat, and will interrupt the soup-like consistency with a firm crunch. It's often included in tuna and chicken salad and served with hot wings for the same reason. Other vegetables that tickle our sense of "bitter" in a pleasing way may be similarly substituted - but celery also acts as a handy swizzle stick. There is no chemical reaction that happens. It is mainly a garnish. You might get a tiny bit of celery flavor in the drink from the celery, but I think this is negligible given the other strong flavors in a bloody mary. If you want a celery flavor, add celery salt. I've always seen it done as a garnish, and only a few places anymore will keep fresh celery around just for one drink, so it's becoming that much rarer. The celery stick garnish became a staple of the Bloody Mary only after an impatient patron at Chicago’s Pump Room couldn’t wait for his server to bring him a swizzle stick. He took matters into his own hands and snatched a celery stalk from a nearby relish tray. Not the answer you're looking for? Browse other questions tagged cocktails beverages or ask your own question. How can this “Bloody Brain” cocktail be made without alcohol? Are there thermo bottles to store tea, as soon as it is made (100ºC/212ºF)? How can I tweak this (US) Southern themed cocktail? Why was my Last Word cocktail red? Why does a (vodka) martini often come with an olive on a stick? Why is juice from concentrate cheaper? Can I make shelf stable cocktail mixers by pressure canning?